ACC no more? 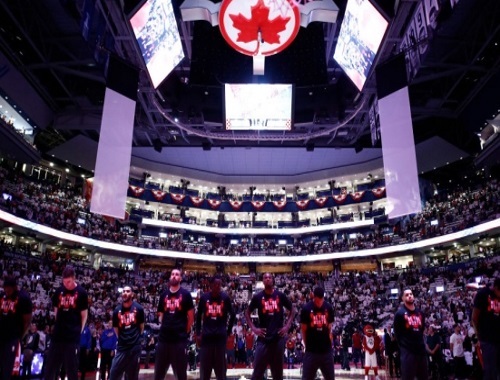 The Air Canada Centre is becoming Scotiabank Arena next July when a 20-year agreement between Maple Leaf Sports & Entertainment and Scotiabank kicks in a record-setting deal. Industry sources say the deal is worth a whopping $800 million. Reports pegged Air Canada's existing deal at $4 million a year. With assets of more than $906 billion as of July, Scotiabank's pockets run deep. On Tuesday, the bank reported $2.1 billion of net income for the three months ended July 31, up seven per cent from the same quarter last year. For Torontonians, the switch caught many off guard. Air Canada has held the naming rights to the arena since it opened on Feb. 19, 1999. The ACC is part of the city's vernacular. Click here for the CBC News article.